Thirty-five artists and seven studios will be participating in the 22nd Take In the Local Color! 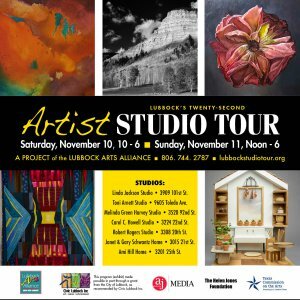 Lubbock’s Artist Studio Tour, November 10-11, 2018. This yearly event gives audiences the unique opportunity to observe artists in their working environments, many of which are in private homes. All participating artists are from Lubbock County and all of the studios are located in Lubbock, Texas. The Studio Tour hours are 10AM-6PM on Saturday, November 10th and Noon – 6PM on Sunday, November 11th. There will be approximately five artists showcased at each studio location. Artists will be displaying original work in the media of painting, drawing, pottery, fiber, jewelry, leather, glass, wood, photography and sculpture. Demonstrations and performances by local musicians at some studio locations will add to the ambiance and festivity of the event. The Local Color Studio Tour is free and open to the public who are invited to travel on their own from studio to studio to see the artwork. A full color brochure with a map and a list of the artists at each studio is available upon request from the Lubbock Arts Alliance, 806-744-ARTS (2787) or can be downloaded online at www.lubbockstudiotour.org.